Functions. In addition to being a pressure cooker, this appliance is a slow cooker, rice cooker, porridge maker, steamer, sauté pan, yogurt maker, and food warmer and it can do so much more! Just when you thought a pressure cooker couldn’t add any more functions, along comes the Instant Pot IP-Smart Bluetooth-Enabled Multifunctional Pressure Cooker! Download a free app to your iPhone or iPad, and you can program recipe scripts directly into your cooker. The Instant Pot Ip-Smart Bluetooth is fully autonomous. It can do almost everything all on its own, except adding in all the ingredients that's still a job you have to do yourself. The innovative Bluetooth technology and the app allow you to control the pressure cooker from anywhere in your home. It also means you can set it up and start it whenever you want without having to actually be standing in front of it. In addition to using this technology, this pressure cooker is also six times faster than other more conventional cooking methods and is 70 times more efficient than an average and standard pressure cooker model. So, how safe is it to use since it is fully autonomous? With its many safety features including the self-locking lid and cool-touch handles, you can rest assured that you are using a safe product. It is also high efficiency and very kitchen friendly, so you also don't have to worry about electrical shorts while the pressure cooker is in use. This multi-purpose cooker also functions as a slow cooker, rice cooker, steamer, sauté pan, yogurt maker, and food warmer. In our opinion, this is the most advanced pressure cooker on the market. It is pretty expensive (see lowest price), but worth the investment if you are serious about pressure cooking. But there is more! 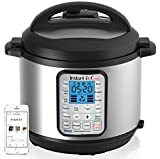 This Instant Pot model features fourteen built-in smart programs that will automatically set the correct pressure and time for cooking soup, meat/stew, beans/chili, poultry, yogurt, porridge, and rice. You can also manually adjust the pressure cooker to add or decrease cooking time. The Instant Pot IP-Smart has three temperature settings. It can be used to sauté, slow cook or keep food warm. Dual pressure settings make it easy to select the appropriate pressure level for the food being prepared. A high-pressure level has a PSI of 10.2-11.6 and low-pressure level or PSI of 5.8-7.2. This stainless steel pressure cooker is safe. It is certified by both UL and ULC, which sets the industry standard for safe pressure cooking. Safety features include excess pressure protection, safety lid lock, automatic pressure control, automatic temperature control, high-temperature warning, extreme temperature, and power protection, leaky lid protection, anti-block vent, and pressure regulator protection. A microprocessor embedded in the cooker monitors the pressure, temperature keeps time, and adjusts pressure and cook time. The Instant Pot IP-Smart Bluetooth Pressure Cooker is attractively designed but is also built to endure. The hinged lid gives easy access to the inner cooking pot that has a 3-ply stainless steel bottom. This cooking pot does not have the Teflon, non-stick coating that has raised health concerns. Stainless steel is also used on the exterior, but this shiny surface is designed to be fingerprint resistant. This appliance is an addition to your kitchen that can be enjoyed for many years. There are many advantages to cooking food in a pressure cooker. Food is ready in 1/3 the time of conventional cooking. Chili or stews are ready in just an hour. Inexpensive meats cooked in a pressure cooker become tender and succulent. Frozen food doesn’t have to be defrosted before cooking. Food prepared in this way also seals in flavor and nutrients. The Instant Pot IP-Smart is a pressure cooker and so much more. As a steamer, it can cook fresh or frozen vegetables in just 2-3 minutes. Steamed potatoes are ready in just 15 minutes. Simply place the vegetables in the steamer basket and let the pressure cooker do the work. The Instant Pot IP-Smart Multifunctional Pressure Cooker comes with a stainless steel steam rack with handles so that the food can be easily lowered into and lifted out of the cooking pot. Silicone mini mitts, a rice paddle, soup spoon, measuring cup and condensation collector, and a quick reference guide cooking booklet and cooking tables are also included with the purchase of your new Instant Pot. Quality comes from experience. The Instant Pot company has designed programmable pressure cookers for three generations. The Canadian company states its goals are to design an appliance that is safe, convenient and dependable. The online website has an abundance of information about their products as well as easy access to extra cooking pots and replacement parts. When I got rid of all my Teflon-lined pots, pans, and pressure cooker I looked around for replacements. Then I read about the Bluetooth enabled multifunctional cooker and I knew I had to have it. Why replace so many appliances, when you can get by with just one? I love the ease of step-by-step instructions and easy to follow Instant Pot recipes. I also like being able to control the cooker with my iPhone. I remember my grandmother using a pressure cooker, and I know she would be amazed and delighted with the technology and multi-purpose appliance that I have now. The fact that this cooker has so many functions has made me enjoy cooking and experimenting in the kitchen. I especially like the porridge and yogurt I have made; this appliance is not only practical; it is fun! There are so many different recipes you can try. The Instant Pot's cooking pot is dishwasher safe so cleaning up after your meal is a breeze. Maintenance for this appliance is also minimal as long as you do your best to keep spills contained and you keep liquids away from the electrical components like the control panel. However, you should still regularly wipe down the outside of the Instant Pot to clean it off and avoid the growth of any bacteria or the build-up of residue. The patent-pending technology of the Instant Pot IP-Smart Bluetooth-Enabled Multifunctional Pressure Cooker is exciting. The quality of the stainless steel construction and the safety features are impressive. Instant Pot models have been certified by experts in the industry. The multiple functions and clear information reflect a carefully-made and conceived appliance. There have been a few complaints about the app, but the pot itself is a winner. Many customers that have used the Instant Pot have raved about how smart and simple the automation is. They also like that the Instant Pot is able to monitor the internal temperature and pressure levels for you, so there is no need to make any adjustments as your food is being cooked. Being able to program your meals and having all these options really does make the process so much easier. The easy cleanup is of course another plus. It cleans like a non-stick coating appliance would clean up. It is easy and requires little effort. The pot being dishwasher safe only adds to the ease of cleaning up after meals. All you really have to do is make sure that the silicon ring and the float valve remain clean. These two parts easily detach and can be cleaned separately. Exploding pressure cookers? Not with the Instant Pot. However, while many boast and speak highly of its pressure cooking skills, others aren't as hopeful regarding the other functions it offers. For example, if you need it to act like a slow cooker for stews, you may find that it requires too much fuss and may end up being too time-consuming. The appliance is more expensive than many pressure cookers, but considering its many functions, the quality of construction, and the Bluetooth enabled technology, it may be well worth the investment. It can also replace several other of your kitchen appliances since it can do so much; although there might be a slight learning curve while you get to know the device and learn its many functions and uses. Yep, exactly why we LOVE pressure cookers – they are so diverse. So Elizabeth, it’s now Late September 2017 – do you still love your Bluetooth InstantPot? Has it held up over time? Has the App been updated? Can only wish it was still $149.95.. Current price $179.95 – My $15 3 cup B&D rice cooker bowl finally wore out, scrapping rice is not fun. I found an 8 quart All in one on Ebay for $30, dent and bent special, it is truly a piece of junk but it works for now, 10 minute rice with chicken, 1 hour fresh bean soup! I didn’t know these devices existed, after more reading I’ve decided the Instant Pot Smart has a place on my counter. It (and the other IP cookers) has parts and accessories available at reasonable prices, with the smart cooker I can view the status of my dinner from work (I have a box sitting next to the cooker at home that I can access from the internet, it talks to the smart cooker and relays the status). I can only hope more manufactures come out with more smart cooking devices! Great web site, it’s in my favorites! Can I use the Bluetooth instant pot with the Android Instant Pot app? I don’t like the idea that you have to unplug to turn it off and on. There should have been a switch for that. Learning to cook with this cooker is not easy a little more help would have been very nice.